No one knows better how to make corn masa to make tamales than Northgate Gonzalez Markets. 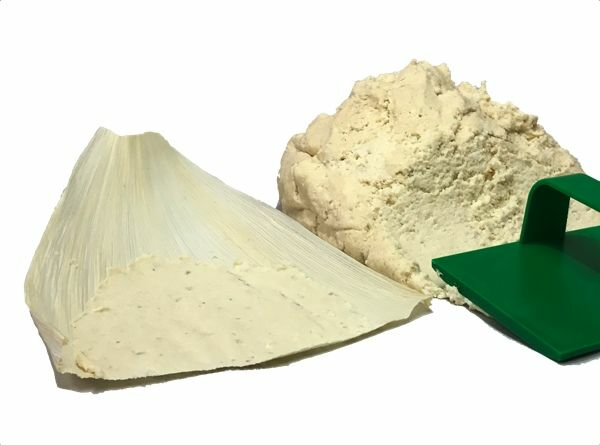 We teamed up with them to bring this authentic dough to make perfect looking and tasting tamales right at your own home, with nothing else needed to add into the mix (unless you want to, of course). This fresh masa is only available at MexGrocer.com. Unless you are lucky enough to find a local tortilleria or have your favorite aunt or grandmother make one for you, this is the best masa you can get online. Just add your favorite filling, like green or red sauce chicken or pork, cheese and rajas, beef or even turkey. Your creations make them the best tamales you can get, because they are homemade. Ingredients: Corn, water, lard, salt, baking powder, calcium propionate (as preservative), trace of lime. Note: Tamale Masa spreader shown in picture sold separately. The texture and taste is exactly right. My while family loves it. I love how it arrives ready to use. The local grocer only carries prepared tortilla masa all year, so it's nice to get tamale masa delivered. This masa was amazing and came prepared. It was so close to my moms that I was able to bring back some fond memories with my mother. This product was absolutely amazing to work with! 1st time tamale making and they turned out exactly like my Grandpa made them. Such good texture and flavor! Will buy again and again ! The ready to use masa is indeed ready to use. Soft, pliable and good. Thank you for such a good product.